Since 1978, J&J Vinyl Fence has custom-crafted beautiful, multi-purpose ranch rail fences made from premium vinyl to suit the needs of thousands of home and business owners across Los Angeles County. With an average of 15 years in the fencing industry, the team at J&J Vinyl Fence can tailor a country-inspired vinyl ranch rail fence that will safely enclose your livestock or distinguish your residential property from your neighbor's property. Our vinyl ranch rail fences are all backed by transferable limited lifetime warranties and can be built to meet all city and HOA mandates. Our time-tested vinyl ranch rail fences are built to outlast saltwater damage, sun exposure, chemicals, insects, wind, and other harmful elements that often plague wood or iron fence owners. We can build a vinyl ranch rail fence with two, three, or four rails across, or install crossbuck railing, which is formed by cutting two rails and placing them diagonally so that the ends meet at each corner of the vertical post dividers. While the fencing specialists at J&J Vinyl Fence understand it may be tempting to buy a pre-made fencing kit online and have it shipped to your home for self-installation, our expertise has taught us that these pieces do not always come in symmetrical parts--which can make for an unattractive, uneven fence--and installation is often harder than it looks. In contrast, our highly trained craftsmen apply their years of experience in using premium-grade tools to cut your fence into perfectly symmetrical pieces in the exact length, width, and height you desire. Additionally, our skilled installers know how to accurately address any sloping angles or unstable foundations surrounding your property to produce a structurally-sound, beautiful vinyl ranch rail fence that will last for decades. 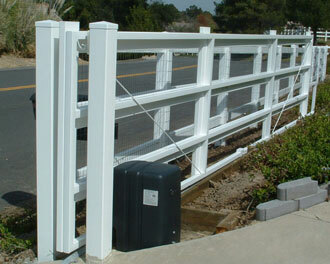 We can also build a functional vinyl ranch rail gate to match. Our vinyl ranch rail fences and gates have served to delineate everything from acres of farmland to city parks to seaside homes. J&J Vinyl Fence invites you to discover why we are the premier choice for vinyl ranch rail fencing across Los Angeles County today. In addition to competitive pricing, exceptional workmanship, a fast response time, and quick turnaround, we also offer new customers a 10% discount. Additionally, our vinyl ranch rail fences are backed by transferable lifetime warranties from trusted manufacturers. Call us now for your free over the phone or on-site consultation!